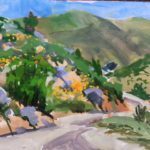 Jeff Yeomans teaches at the Athenaeum School of Arts in La Jolla and gives workshops en plein air (outdoors) at scenic spots around Southern California. 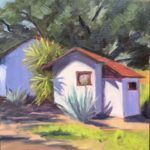 He is one of California’s top Plein air and studio painters. This was Jeff’s 6th workshop with us. 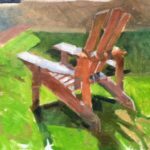 Plein air artists must work quickly, before the light changes too much on their subject. It’s a challenge to mix the correct color quickly and apply the paint with confidence. 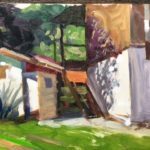 Jeff teaches students about the color basics – primary and secondary – and that any color can be made from just a simple collection of pigments. Jeff’s motto of “Keep it simple” helped us focus on 3 areas – composition, values, color. Many beginners are so awed by the colors they see they forget to make an interesting composition of the scene in front of them. Jeff teaches us to crop and eliminate meaningless details. Then we study the light and shade we see. Then we mix a color after evaluating the intensity of the hue. After wine tasting in Valle Guadalupe, we returned for a gentle critique of our morning’s efforts. We’d all made more sophisticated color choices. 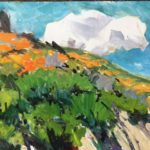 Because of all the rain this year, the poppies were blooming in drifts on the canyon hillsides so Jeff was inspired to catch the scene. Saturday morning we drove our easels up the entry road and set up to paint. Some chose close ups, others took the long view, but all were stunning reminders of the beauty of the Californias in the Spring. Each guest captured an essential but different aspect of the beauty before us. 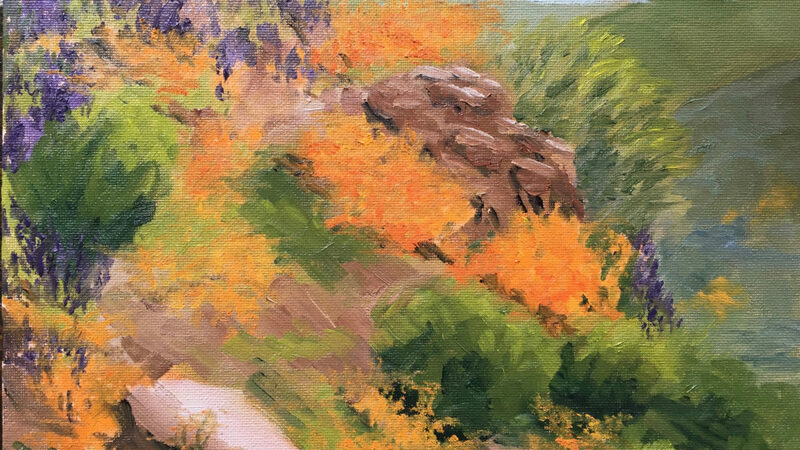 Some of us went riding after lunch, others wanted to paint… a blooming peach tree was the subject for an afternoon canvas. By Sunday morning each of the 7 painters had canvases they were proud of and as we packed up we wished we could stay and paint more. We look forward to Jeff’s return!